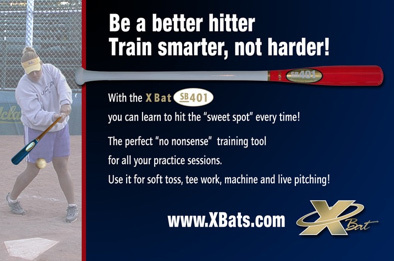 Fungo/Training X Bats makes a variety of training and coaching bats for players of all ages. We offer 3 different coaches fungoes in 33", 34", 35" and 36" lengths: a regular fungo, an extended barrel fungo and a Fungo 73 with a large flared knob for comfort and balance. We offer the LOG for overload training, the Short Barrel Training bat for underload training and a special flat bat to encourage proper backspin and hand positioning on the bat. We also offer two Shorty bats for one hand drills and coordination. The Shorty 2 was designed to make it easier on the elbow for players doing one handed drills. It has a large extended 2” knob that acts as a counter-balance to the weight in the barrel. The Log is a heavy training bat with an oversized 2 7/8" barrel and a weight range from even to +8 ounces. It is used for overload training hitting drills including live hitting under a coach's supervision. The Short Barreled Training Bat was developed as an under load training tool to build bat speed and train the hitter to hit the sweet spot- both very necessary to hitting with power and consistency. Just making contact is no longer acceptable. Today, not only making contact, but hitting the "sweet spot" with optimal bat spees is crucial to have any type of success. The Shorty comes 26", 27" and 28" lengths with a full barrel. These are meant for developing hitting technique, hand & wrist strength with one handed swings from a tee or short toss. This is a classic fungo bat in hard maple for coaches at any level. The 33" and 34" are great for infield drills, the 36" is designed for outfield drills and the 35" is an all purpose fungo for both infield and outfield drills. The ideal addition to any coach's teaching tools. Now our most popular bat handle and knob is available on our Pro Maple Fungo 73 in 33", 34", 35" and 36" lengths. This fungo has great balance and comfort and allows every coach to hit fungoes longer than his players can field! This bat almost swings itself. These flat sided training bats were developed by Reggie Smith, a 17 year Major Leaguer, big league batting instructor, US Olympic Team Hitting coach and owner of two baseball academies in Florida and California. The RS Backspin is meant to train proper palm up palm down hand position to encourage a smooth path through the hitting zone. Hit on the round side for immediate feedback that your hands are in the correct position. The RS Backspin Training Bat has been designed for both tee and short toss drills and live batting practice to exaggerate the proper palm up palm down hand positioning when hitting. Watch Reggie's video explaining the proper use of this great training tool. These flat sided training bats were developed by Reggie Smith, a 17 year Major Leaguer, big league batting instructor, US Olympic Team Hitting coach and owner of two baseball academies in Florida and California. The RS Backspin Shorty is meant to train proper palm up palm down hand position to encourage a smooth path through the hitting zone with the use of one handed drills. Hit on the round side for immediate feedback that your hands are in the correct position. The RS Backspin Youth Training Bat has been designed for both tee and short toss drills and live batting practice to exaggerate the proper palm up palm down hand positioning when hitting.